Who Are Looking For Your Services? There is no industry conference that matches the caliber, content or value available in the 4 days of the IT Sales And Marketing Boot Camp. No boring speakers or subjects at this event; everything is staged to educate, motivate and equip IT business owners to make 2020 their best year ever and continue to grow their business. 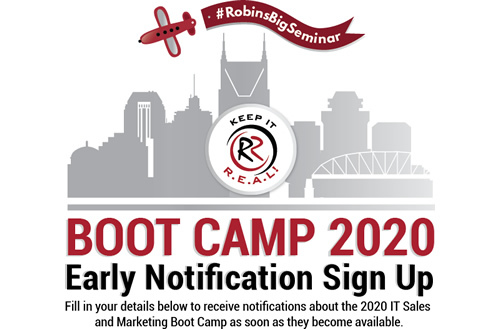 Partnering with Technology Marketing Toolkit for the 2020 IT Sales And Marketing Boot Camp extends the opportunity for your company to connect with – and sell to – a targeted audience of over 1,100 IT business owners who are willing to invest their time and money to attend and learn how to grow their business. "Within Robin's Group Alone, We've Seen About 400% Growth In The Last 2 Years"
"We spend the time and the money that we do in sponsoring Robin's programs and events because we found that the partners who come from Robin are more successful than those who don't and are growing faster than your average MSP. We have seen a significant growth in the number of partners we have been able to recruit from Robin's group, and the success with those actual partners has been phenomenal. Through her events alone, we've seen about a 400% growth in the last two years in the number of customers we've been able to acquire, and a number of MSPs have become partners; and those partners who are trained on marketing by Robin deliver a 200% higher sales rate than our 'average' partner acquired somewhere else. So if you're a vendor and you're actually interested in looking at a place to spend your money, you can't go wrong by sponsoring one of Robin's events. It's been one of our highest ROIs, often paying for itself in new partners and contracts before I leave the event." "I Love Sponsoring Robin's Events Because They Are Well-Run, High-Energy Events Packed With Quality Prospects, And It's The Highest ROI Of Any Group That eFolder Partners With"
"Robin's events are consistently bringing new leads to our booth and creating new opportunities for the sponsors. The people who attend Robin's events form a wonderful community, and eFolder wouldn't miss these shows for the world. Within 60 days of sponsoring her events, we expect about 100 new eFolder partners. These shows provide us with the highest ROI of any group that eFolder partners with. If you're a vendor looking for new, qualified leads in the IT industry, Robin's events are a must." "We Look Forward To Continuing Our Strong Partnership With Robin"
"The Robin Robins Cyber Security Roadshow was a great sponsorship opportunity for Microsoft to meet with both existing and new partners. We were given lots of opportunities to connect with partners throughout the 1½ days, and the logistics were incredibly simple and well-managed. The partners in attendance were keen to chat and learn more about Microsoft Cloud Solutions. We look forward to continuing our strong partnership with Robin and team." "We Sign Up A Lot Of People At Our Booth Because They Can See All The Products, See Us And Get The Face-To-Face Interaction"
"We've been coming to the Boot Camp events as well as the Producer's Club events and really enjoy it. We get to meet with a lot of our clients, new clients and existing clients, the CEOs and owners, which is fantastic. We sign up a lot of people at our booth because they can see all the products, see us and get the face-to-face interaction. We've done a lot more than just sponsoring the booth as well – bags and a few other things, and had great success with that." "We've Never Had A Bad Show With Robin And Our ROI Is Always Astounding"
"Robin Robins' events are our favorite events time and time again. The quality of the leads here is terrific and the people that Robin puts us in front of are precisely the kind of people we want to partner with. The attendees at Robin's events are extremely serious about growing their business and invest copious amounts of time and energy to be here. Technology Marketing Toolkit events are designed to let the attendees meet and speak with the sponsors, and many spend quite a bit of time talking with us and about us. This group is a great referral source. We've never had a bad show with Robin and our ROI is always astounding. Since starting with Robin, we've grown to almost triple our original size." "Can't Wait To Come Back Next Year"
"The quality of the partners here at the Robin Robins Boot Camp is great, and the response to Auvik's network infrastructure RMM has been amazing. We've been having so many excellent conversations and can't wait to come back next year." "I’m blown away. We have seen an incredible boost in sales since sponsoring Robin Robins’ events. But the thing that strikes me is that we are consistently talking to our ideal prospects at these events and it’s never a waste of time. Prospects who are educated, hungry to grow, and willing to make an investment in their success are frequently found at Robin’s events. Not only that, the support from Robin’s team is incredible. They really go above and beyond with sponsors both organizationally and logistically to work with them for a positive outcome. I strongly give my recommendation to anyone thinking about being a sponsor."